Available in Red, Silver, Yellow, and Black Calipers with options of Slotted or Cross-Drilled Rotors. 6 Pot Calipers with 355 mm x 32 mm 2-peice rotors. Brembo kits consist of cross-drilled or slotted ventilated, integral or composite discs and aluminium calipers with 6 pistons; a complete set of high performance pads; metal-braided hoses and high quality hardware. The kit consists of aluminum calipers with opposed pistons which, depending on the car model and in increasing order of performance, may be composite, monoblock or even billet monoblock components, combined with cross-drilled or slotted integral or composite oversized discs. The heart of the kit consists of aluminum calipers. These are also available as monoblock parts machined from a single billet of cast aluminum, which ensure outstanding rigidity and minimized deformation. The discs supplied in the kit, which may either be floating or integral, depending on the specific car model, feature an exclusive venting system that improves cooling capacity and increases resistance to cracking caused by thermal shock by over 40%. Featuring a hat in aluminum alloy, the oversized floating disc system reduces unsprung mass (for improved handling) and thermal stress. The mounting system is engineered to permit a greater degree of both radial and axial float. With a combination of painted calipers (available in red, black or silver) flaunting the Brembo logo, and slotted or cross-drilled discs, the Gran Turismo kit gives an unmistakably sporty, eye-catching look to the car, offering that extra special touch for drivers who want their vehicle to stand out from the crowd. Catering for the more discerning driver is the GT-R line of kits. These offer even more performance and consist of billet-monoblock calipers, slotted discs in diameters up to 355 mm and special high performance pads. 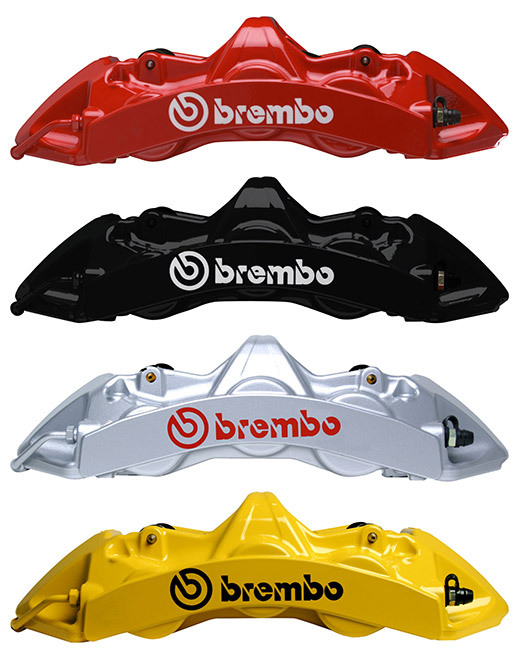 Brembo is a world leader in the design, development and production of braking systems and components for cars, motorbikes, industrial vehicles and machinery, for the OE market, after-market and racing. The Group has recently branched out into the design and production of safety systems. Brembo guarantees the utmost safety and comfort and improved product performance thanks to process integration and optimization of the entire production cycle, from the initial design and cast-iron or aluminum casting to assembly, testing and simulations on the bench, track and road. Brembo's constant quest for innovation calls for new technologies, new materials, new shapes and new markets; product performance is accompanied by the search for a unique style in line with the design of the equipped vehicles. Research at Brembo is conducted at the Research & Development Centre, which has also been involved since 2002 in mechatronics, a border science that combines mechanics, electronics and informatics. The increasing application of ecocompatible technologies, recycling of all materials used in the production process and systematic prevention of all forms of pollution all bear witness to Brembo's commitment to safeguarding the environment. For Brembo the workforce is considered an invaluable asset, providing the thrust and drive that lead to any breakthrough – Brembo works as one great team. Brembo sells its products in 70 different countries and has production sites in Italy, UK, Poland, Czech Rep., Spain, Germany, Brazil, Argentina, the USA, Mexico, China and India. The products are marketed by companies located in the main outlet markets, with headquarters in France, UK, Sweden, Russia, the USA and Japan. The Group has 7.700 collaborators; close on 10% of whom are engineers and product specialists involved in research and development.